Home made pan fried halloumi on rocket, toasted ciabatta with balsamic reduction. There is an almost unbearable smugness that comes with frying up a piece of home made halloumi. It might be a bit of work, but the satisfaction and the cheese is completely worth the journey. 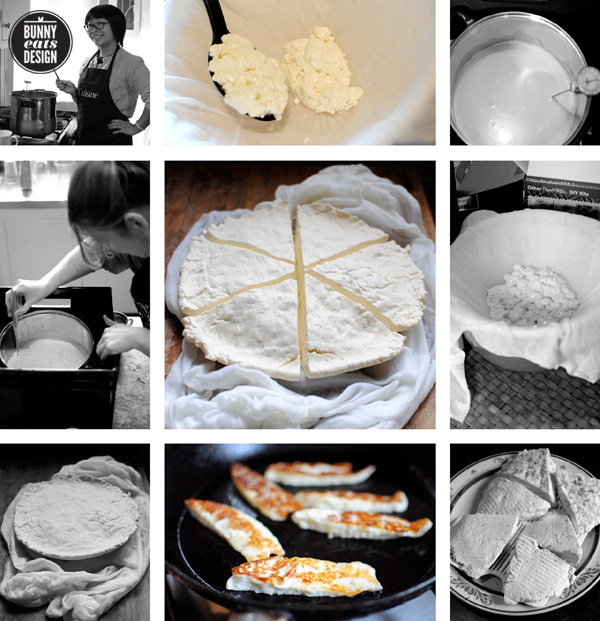 A couple of weekends ago, I roped in my best friend Coco into a day of cheese making. She is more adventurous than I when it comes to cheese, but we have a mutual love of squeaky cheese or halloumi. As a virgin cheesemaker, I didn’t have a single specialty item I needed to make cheese, so instead of buying each new item on it’s own, I opted for the easy way out and bought a Mad Millie Fresh Cheese kit. There are several kits available, but for me, the fresh cheese kit meant quick results so fresh cheese it was. The fresh cheese kit also makes feta, quark, cottage cheese, cream cheese and ricotta. It’s not cheap at $70NZ but the items soon add up when bought individually and at least I knew I have all required pieces. The only extra items I needed but didn’t aleady have were 4 litres of unhomogenised milk, a large stockpot and a container to use as a bain-marie. 4 litres + 1 cup of milk yielded six pieces of halloumi and a small portion each of ricotta which is a by product of halloumi. Money-wise, it’s great value if you don’t take into account the cheese making kit. It’s quite exhausting making something for the first time as it’s reading instructions, re-reading and second guessing yourselves and I would recommend doing it with a friend. It’s always good to have more than 1 pair of hands. Besides, what is one person going to do with 6 pieces of halloumi? I jest! I jest! I know exactly what I’d do with six pieces of halloumi. Hopefully next time will be much easier. I’m also keen to make cream cheese and mozzarella now too. Yum. 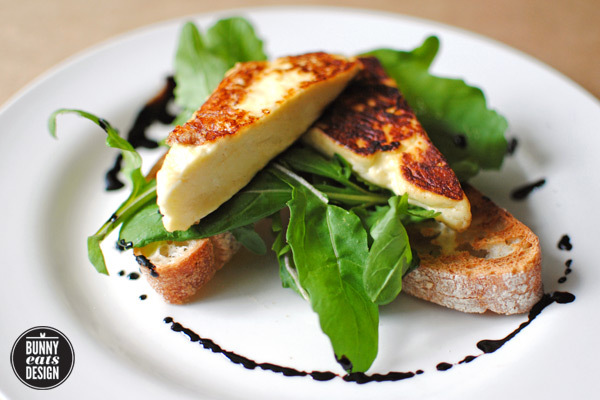 My favourite way of serving halloumi is to pan fry it and then lay it on top of rocket and toast with a drizzle balsamic reduction. My recipe for balsamic reduction makes enough for two but you can easily multiply the ingredients to make more. I always make just enough balsamic reduction for the meal at hand because I don’t see the point in making a big batch to use up slowly. It’s easy enough to whip up on demand. As well as halloumi, balsamic reduction also goes well with eggs benedict or roast vegetables that have a little sweetness to them like roasted beets, kumara (sweet potato), onion or brussels sprouts. In a small saucepan, bring the vinegar to the boil and then turn the heat down and let it simmer until it is reduced by about half. Do not let it boil dry. Add sugar and simmer, stirring frequently until all the sugar has dissolved and the sauce is thick and dark. It will thicken up as it cools so use it quickly. P.S. if you’re wondering why there are no photos of the ricotta or the bacon and pea pasta I made with it, well that’s a first world problem. Looks delicious! I thought that I was the only one who thought of halloumi as squeaky cheese! sorry you didn’t take a photo of the ricotta, etc – but the pictures you did take look great (that’s def something i need to work on on my blog)! Hi R, I’d love to share, but I’d feel terrible about sharing the recipe as it’s not my own work and I’m no cheese making expert. You can find similar recipes for Halloumi from various sources online though. Haha! I get that feeling a lot. I get half way through eating and think – oh damn. I have only ever made ricotta before. I made it from goats mik and it was absolutely delicious! I just looked it all up because I want to make blue and camembert but it’s so expensive.! You’re right, it’s a bit pricey but an investment if you buy cheese regularly. 8 weeks! I don’t know if I could wait that long. I will have to build up my patience. Nice one! I think I will have to buy one of these kits – make a good Christmas present. Until then, I’ve got some Collective Haloumi in the fridge. That looks yummy. This is out of my league-what an undertaking! I’m sure many would think that honey is out of their league. Me include! 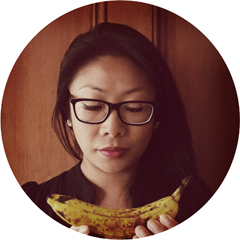 You should totally pair up with a cheese maker and have cheese and honey banquets.